Your eyes are often the first feature to show the effects of age, sun damage, and lifestyle choices. The skin around the eyes is infamously thin and moves constantly, so it does not take long before fine lines, wrinkles, and the loss of elasticity become apparent. When this occurs, many individuals experience diminished self-esteem and confidence. To combat these effects and achieve brighter, more youthful eyes, PREMIERE Center for Cosmetic Surgery offers several treatments. Dull, aging eyes are often the result of sagging upper or lower eyelids. Laxity of the upper eyelid creates excess weight and limits how wide you can open your eyes. This decrease in your range of vision not only makes driving dangerous but limits your ability to express a full range of emotions. Sagging skin below the eye results in dark circles and puffy bags, contributing to a tired appearance. 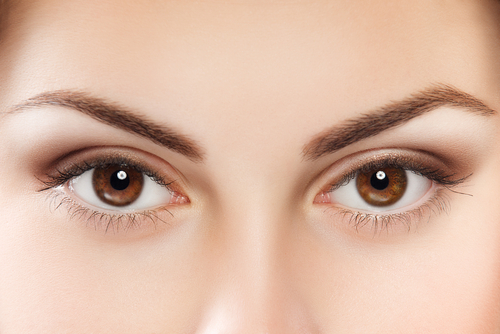 Blepharoplasty is a surgical procedure performed to counteract aged or sun-damaged eyelids. This surgery minimizes the effects of aging by trimming and removing excess skin and repositioning underlying tissues or fat pockets. After blepharoplasty, eyes will open wider, and the surrounding skin will lay smoother, allowing you to increase your range of vision and experience more taut, rejuvenated eyelids. Your forehead skin stretches and contracts with every facial expression. This constant movement speeds up the rate at which your skin’s elasticity deteriorates, causing the skin to become loose and the eyebrows to fall. The weight of the brows causes similar effects to an aging upper eyelid. When a falling brow and an aging forehead are causing a patient to look older, brow lift surgery can be performed. This procedure returns the brows to a higher elevation on the face and smoothes out horizontal wrinkles and deep creases along the forehead. Much like a brow lift, BOTOX® Cosmetic addresses aging around the eyebrows and forehead, including crow’s feet and frown lines. However, unlike a brow lift, BOTOX® Cosmetic does not involve surgery. This injectable treatment temporarily smooths aged and wrinkled skin by relaxing the muscles, preventing them from contracting. Although the effects of BOTOX® Cosmetic do not last as long as blepharoplasty or brow lift surgery, it is an ideal treatment for patients who are looking for something non-invasive, have mild to moderate aging around the eyes, or cannot spare the time required for a recovery period after surgery. Regardless of the method you choose, blepharoplasty, brow lift surgery, or BOTOX® Cosmetic can result in brighter, more youthful eyes. To learn more about how these procedures can help you, contact PREMIERE Center for Cosmetic Surgery by calling (813) 413-7717 or by filling out our online contact form.